Business & Dining with Civility is truly a gift of wisdom, practical information and guidance on business, education and dining etiquette. Author, educator and mentor, Nonnie Cameron Owens has dedicated her life to young people, guiding them as they take their next steps in life with confidence. Since 1987 she has been a valuable source of personal and professional tools that encourage the sensitive awareness grounded in respect—of yourself and others. It is called civility. It was an honor to work with “Mom Nonnie” at Purdue, and also to have her facilitate programs for my bank staff. This little book captures it all. It's a treasure. More than likely, in high school or college you were more concerned about sports or academics than attending cotillion or manners/etiquette classes. Now you are in the job market about to go to a job interview over lunch or ready to attend a formal dinner at the CEO's home. Do not panic! 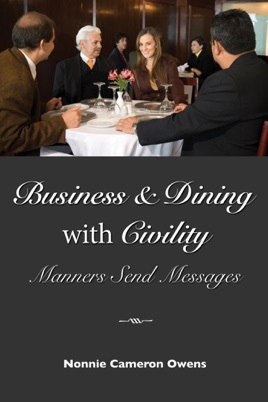 Business & Dining with Civility will give you the information you need in today's business and social circles where knowledge of civility in practice is so important. It will definitely give you the competitive edge! Nonnie advocates etiquette, civility and manners because she knows it makes a difference, especially in the lives of young people. Apply these principles and tips for your next job interview, business dinner, conference, or even your next date! Manners send messages.